The multiple-Ignatz-Award-winning cartoonist has written “a couple graphic novels for kids,” he says, in a phone interview punctuated by background chatter from his 4-year-old son, Eli. Squirrelly Gray is different, “sort of a hybrid between verse and comics,” he explains. It’s also his first book from a big publisher. At ComicCon, the mammoth cartoonists’ convention held in San Diego, a Random House editor came up to Kochalka and told him he liked his comics, he says. Soon they were discussing his plans for a picture book. Kochalka uses Eli as a “test audience” for his comics, he reveals: “I’ll write a chapter and then read it to him as a bedtime story.” But he hopes older readers will like Squirrelly, whether they’re parents, fans of his other work, or both. “If your children’s book doesn’t appeal to adults, then you’ve really failed,” he says. 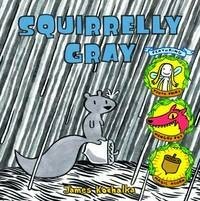 Squirrelly Gray by James Kochalka. Random House, 40 pages. $12.99. Trailer at http://www.squirrellygray.com. James Kochalka will introduce Squirrelly Gray and sing songs with his band on Sunday, September 16, at the Burlington Book Festival, 12:30-1:30 p.m., Waterfront Theatre Great Room, Third Floor.